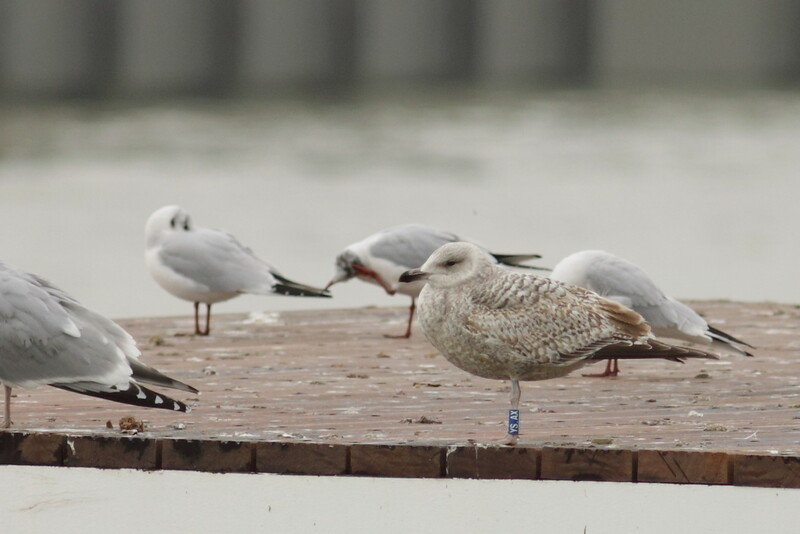 Today, just 1 c-ringed bird in Nieuwpoort: Herring gull blue YS.AX, the same bird I saw 2 weeks ago. 2nd cal Herring gull blue YS.AX (E. Stienen), my 2nd observation of this bird. 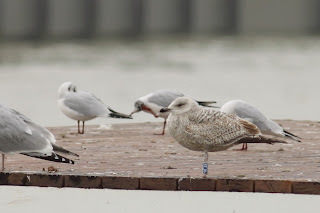 Today I could read the rings of 2 Belgian Herring gulls in Nieuwpoort, one c-ring and one metal ring, both new to me. The first was a 2nd cal bird with c-ring YS.AX (E Stienen), the other an adult bird with metal ring Brussels H-131047. 2nd cal Herring gull blue YS.AX (E Stienen). Ad Herring gull Brussels H-131047. Today, during a short lunch break, I was very happy to find a Dutch-ringed Black-headed gull on the beach of Middelkerke (West-Vlaanderen), with white ring E8SC. I also managed to read 4 metal rings of Turnstones in Oostende, probably all locally ringed. There were also 2 Belgian Herring gulls, but the codes could not be read entirely. Black-headed gull white E8SC (F Majoor), this bird was colour-ringed in summer 2010, and already had a Belgian metal ring. It was seen in the autumn of that year on the same beach as where I saw it, but had not been seen since!